Wow, so few posts for such a momentous episode?! I was about to say exactly the same thing I'm guessing all the comments are in the Part II thread. The two episodes are really one, and even though I just watched both of them, I'm already having trouble remembering exactly which bits are in I and which in II. Still ... I think in some ways I'm even more fond of Part I than I am of Part II. I'll be watching this tonight after Babylon Squared and before WWE part 2. I'm going to friend's house and we're having curry and watching B5. Yay! Actually it was pizza but it was a good evening. 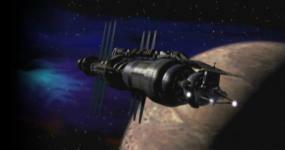 Babylon 5 goes with many meals. Aww, I'm kinda envious! I've been re-watching all by myself. I don't really have any nearby B5 fan friends, these days. I do have food, at least! I'm very confused. Why is the thread about WWE but the poll above is for Severed Dreams. Is it me or my browser? Something is screwy. But back on topic, yes, this episode (and WWE2) changed EVERYTHING for me! This was the episode that made me go back and watch it from the beginning and suddenly I started to get it; that it is a novel, not a short story. I agree that WWE is sort of a game-changer. Suddenly you realize how everything is connected. It's a pretty amazing experience. You can't really re-live that after the first time, but it's still a great set of episodes. I think the board needs to stay pretty low-maintenance. And I"m not sure there is a fix, apart from starting new poll threads.